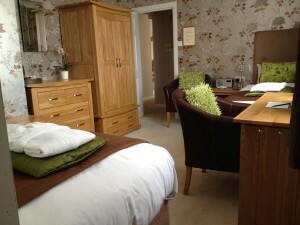 Cosy Ruby is a small twin room on our ground floor. Just opposite, and a few steps from the room, is Ruby’s bathroom, the only room at Ramsey House with a bath. Hence Ruby is popular with our walkers! Although she is small, Ruby has accommodated many guests for a week in comfort, and includes all the luxuries of our other rooms, such as bathrobes and L’Occitane toiletries. The lounge is always available for your use in the day and evenings; please note there is no desk or tub chairs within the room itself.